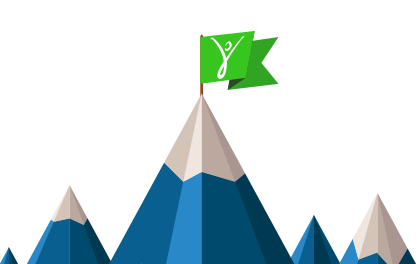 Find out how you can use your talents, time, and treasure to advance the profession — while gaining recognition for your contributions. NIRSA owes its success to the leadership of dedicated volunteers, members who generously donate their time and expertise to directing NIRSA’s operations and services. These volunteer leaders pool their experience in the collegiate recreation profession to support NIRSA members in their contributions and achievements in the field. Thanks to their efforts and attention, NIRSA helps create and sustain powerful communities of wellbeing in settings worldwide. Efforts to support future leadership within collegiate recreation continue, and can only be done with your help. Consider contributing to the NIRSA Foundation. Donations to the NIRSA Foundation are the only tax-deductible contributions allowable to a NIRSA-related entity. The NIRSA Services Corporation is a wholly owned subsidiary of NIRSA created to develop, guide, and implement marketing opportunities through collegiate recreation. The NIRSA Service Corporation is the entrepreneurial and economic development component of the association. NIRSA owes its success to the leadership of dedicated volunteers, members who generously donate their time and expertise to directing NIRSA’s operations and services. These volunteer leaders pool their experience in the collegiate recreation profession to support NIRSA members in their contributions and achievements in the field. Thanks to their efforts and attention, NIRSA helps create and sustain powerful communities of wellbeing in settings worldwide. 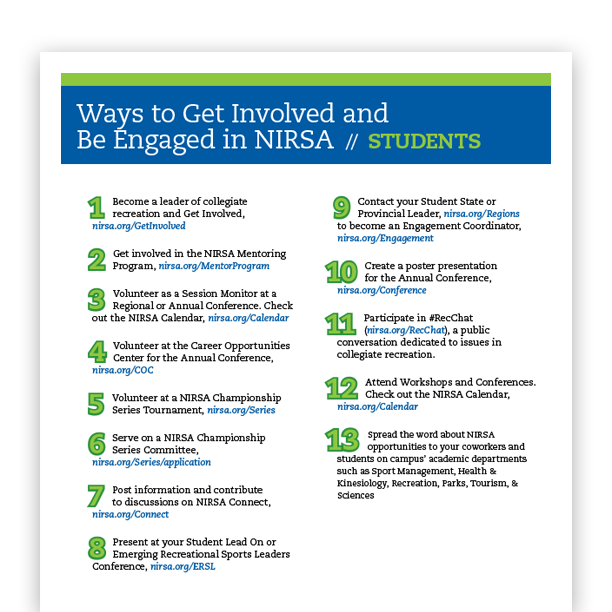 As a NIRSA Member you bring tremendous value to the field of collegiate recreation. 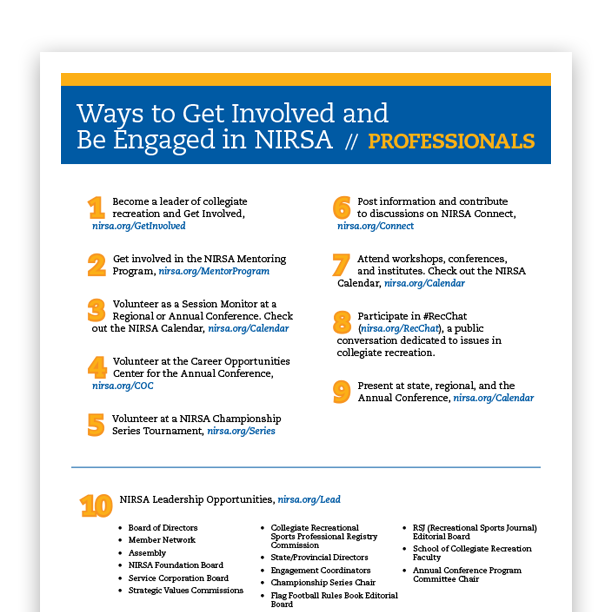 Whether you are a professional member inspiring passion within student members, a student member going above and beyond, or represent an institutional member finding creative solutions, NIRSA members strive to recognize the excellent work of their colleagues. Make sure you’re recognized for your achievements in the profession. Apply — or nominate someone — for our prestigious awards.